It may not always be stairs inside the home that cause difficulty for some people. Steps leading to a porch or front door can be as challanging to climb as stairs in your home. We at Dolphin Stairlifts realise that being independant in your own home also means being able to go in and out as and when you choose without feeling trapped by steps. Outdoor stairlifts work in exactly the same way as indoor stairlifts and are designed with comfort, safety and reliability in mind. They come with weather proof components designed for use in all seasons. 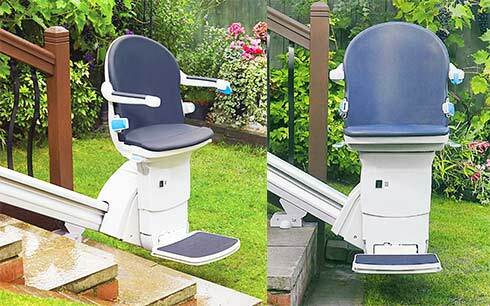 The process for having an outdoor Stairlift is exactly the same as an indoor stairlift. A qualified stairlift engineer will visit you in your home take a look at where you need your stairlift and will give you the best advice for what will suit your needs, you get the same no obligation free quotation that we would give for an indoor stairlift. The Handicare 1000 Outdoor Stairlift if fully waterproofed and designed to overcome the problems caused by external straight stairs. Like all handicare stairlifts the outdoor model has a key switch to prevent unauthorised use of the lift, which means it can be isolated when not in use. Supplied with UV stable slate grey upholstery, Handicare's outdorr stairlift also comes with a waterproof cover to keep it protected from the weather so its always ready to use. Slimline, stylish design with folding footrest and chair base leaving space free on the steps for other people to pass easily. Charge points at the top and the bottom of the track to park and charge your stairlift. Swivel seat with manual swivel lever on both sides of the chair making it easier for you to get out of your stairlift after travel. Diagnostic display showing the stairlift’s status, so any problem can be easily resolved. Safety edges around the footplate and carriage, so the stairlift automatically stops if it meets an obstruction. Retractable safety belt to secure you in the seat when in travel. All the same great features as the indoor Platinum Horizon stairlift, the outdoor version is fully waterproofed, it also comes with a key switch to prevent unauthorised use of the lift. The Upholstery on the chair is easy to wipe down and keep clean. The paltinum Horizon outdoor stairlift also comes with a waterproof cover to protect your stairlift from the elements when not it isn't being used. Fixed seat, back, height and arm positions. Maximum user weight limit 19 stone (120 kg). Digital diagnostic display in carriage.